Vancouver, British Columbia--(Newsfile Corp. - August 10, 2018) - Spearmint Resources Inc. (TSXV: SRJ) (OTCBB:SPMTF) (FSE: A2AHL5) ("SRJ" or the "Company") wishes to announce that the work programs on its NEBA Golden Triangle property are ongoing. The Company has just finished an airborne survey completed by Precision GeoPhysics and the data is currently being analyzed. Additional work programs will be formulated with this data and the highest priority drill locations will be targeted. The NEBA property directly borders Aben Resources (ABN.V — TSX.v) Forest Kerr Project in the Golden Triangle of BC where ABN announced significant drill results yesterday over an "interval of 38.7 g/t Au over 10.0 metres including 62.4 grams per tonne gold over 6.0 m starting at 114 metres downhole"
James Nelson, President of Spearmint states, "We are very pleased with the continuing work in progress on our NEBA property. The significant drill results just announced by Aben highlight the potential in the Golden Triangle and we are very optimistic considering our NEBA project directly borders Aben's discovery." 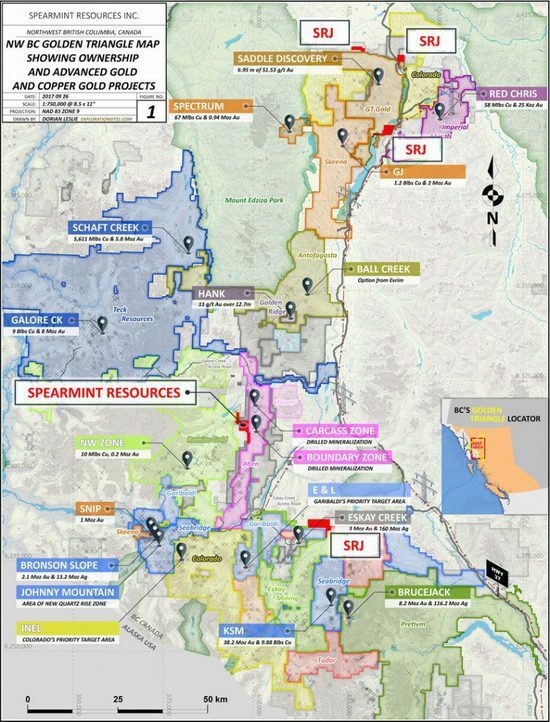 Spearmint's current projects include a portfolio of lithium prospects. The 'Clayton Valley Lithium Prospects' in Nevada comprise of two claim blocks totalling 800-acres bordering Pure Energy Minerals (PE.v) & Cypress Development Corp. (CYP.v). Spearmint's 'Chibougamau Vanadium Prospects' comprise of four separate claim blocks totalling 9,735-acres bordering, or in the direct vicinity of, the vanadium deposit of BlackRock Metal's (private) Ilmenite vanadium project, Vanadiumcorp Resource Inc. (VRB.v) and Vanadium One Energy Corp. (VONE.v). Spearmint's current projects also include three areas of focus on gold in British Columbia; the 'Golden Triangle Gold Prospects' comprising of four separate claim blocks totaling 4,095-acres bordering GT Gold Corp (GTT.v), the 'Gold Mountain Prospects' comprising of three separate claim blocks totaling 1,245-acres bordering Barkerville Gold Mines (BGM.v), and the 3,052 acre 'Neba Prospect' bordering Aben Resources Ltd (ABN.v). Spearmint's 8,482 acre 'EL North' Nickel-Copper Prospect is a contiguous land package that includes the 'EL North, EL North 2 and the BUDDY claims' in the Eskay Creek Camp bordering Garibaldi Resources Corp (GGI.v). Spearmint's 10,300 acre 'WHY WEST' Magnesium project near Rossland, BC directly borders West High Yield Resources (WHY.v).